It will connect POP/AoA and Caribbean with DHS/Epcot. And likely raise the prices there. Possible I.D. of the gondola make and model here. Can gondolas handle wheelchairs, strollers, and EVC? Yes, here. Will it be installed in other places? No plans right now, but, always a possibility if it works out well. It has been reported that the gondola's will NOT have air conditioning, but there is extensive discussion that this should not be an issue. This has been discussed in other threads but it is time for it to have it's own thread. Recent permits related to Caribbean Beach Resort and DHS seem to indicate that a new transportation system between CBR, DHS, Epcot and possible AOA might be in the works. The CBR permit showed these two new structures which by themselves don't look to interesting. A DHS permit this week shows two more new structure around DHS, as well as a construction access road which is not shown here. The shapes, location, and orientation of these structure form a interesting pattern that may not be coincidental. Thanks to @P_Radden for this map. Based on this information a gondola/skyride system of some sort looks like a possibility. That would be an interesting idea. Based on the fact that it crosses over the parking lots for both BW and DHS I have to assume it's something elevated so a standard light rail system would be out. 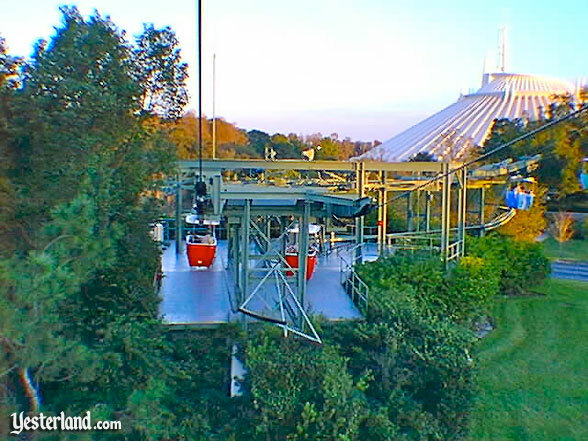 Could it be a peoplemover system? That would have to be cheaper than a monorail I would think. Really hope this is true. It would provide another unique form of transportation for the resort. Thru-put on gondola would presumably be too low to justify the expense. Elevated does seem to be the only way to cross the roads/parking-lots. As Arte Johnson used to say, "very interesting". I like it. It's cool and distinctive, but not cool enough to ruin the appeal of the monorails. The hotels getting coverage should be able to scale up thousands of rooms and this will make them that much more attractive. This will allow Disney to properly compete with mid tier Universal Hotels. This particular amenity is great and unusual. With that said, International Gateway may need to be looked at depending on the scale of the system. If it connects with Art of Animation/Pop it may need a redesign just for capacity. This is a much better way to get to the parks. Edit: Disney has also been on a green push. This would reduce their carbon emissions by moving more to electric transportation. RCID already is nuclear and solar heavy as I recall, so this would fit into the plan. Very interesting. The fact that it lines up with the International Gateway makes your thought much more plausible. The only thing I question is the trip over the existing CBR buildings, or are those the ones that are set to be demolished? Gondolas and a Sky-ride are very low capacity, very susceptible to weather (wind and lightning) are incredibly unreliable, and do not have adequate climate control for a Florida. (No AC). Also the straightline diagram @danlb_2000 provided goes over buildings at CBR that are not being demolished. The one thing this does have going for it, is that it is cheap. Thinking of those 90° turns. The could have a third entrance/exit out of those structures. So would it go over the Aruba/Jamaica at CBR buildings or are those being demolished as well? Direction changing buildings are quite similar. Is there any possibility this could be for underground utilities or infrastructure? This is from Whistler mountain in Canada. The lift covers something like 3 miles in about 10 minutes and has 28 of these gondolas that hold up to 28 people. It has an hourly capacity of over 4,000 riders but would be less if it has to make multiple stops. I assume it could also be air conditioned for FL heat. The whole thing cost something like $50M to build a few years ago. Much cheaper than a monorail. I'm pretty sure the thunderstorms would still be a problem for these. Just doesn't seem like it would have the capacity to be worthwhile. They could buy hundreds of buses for the same cost.